RIT/NTID students were honored with their families and friends at an academic awards ceremony May 18. NTID President Gerry Buckley, front row center, hosted the event. 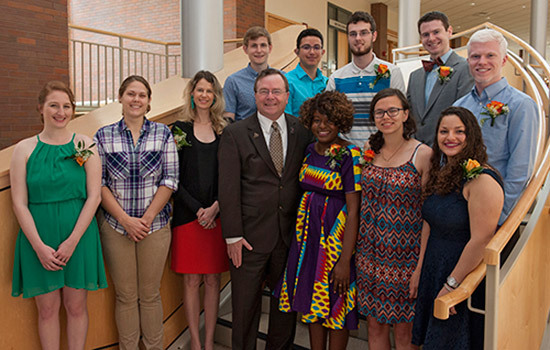 Several students at Rochester Institute of Technology’s National Technical Institute for the Deaf were honored with their families and friends at an academic awards ceremony May 18. NTID President and RIT Vice President and Dean Gerry Buckley hosted the ceremony. Cody Cummings, a laboratory science major from Austin, Texas, received the Academic Achievement Award for students earning an associate degree and was the 2017 NTID college delegate for undergraduate students. Rachel Soudakoff, a political science major from Burbank, Calif., received the Academic Achievement Award for students earning a bachelor’s degree. Lucas Prilenski, an electrical engineering major from Chesterfield, Mo. ; Daniel Mooney, an information sciences and technologies major from McLean, Va.; and Misti Roe, a visual arts major from Madison, Wis., received Academic Achievement awards for students earning master’s degrees. Arturo DeSantiago Jr., a computer integrated machining technology major from El Paso, Texas, and Natasha Hill, a design and imaging technology major from Anchorage, Alaska, received the Outstanding Graduate Award for students earning associate degrees. Amie Sankoh, a biochemistry major from Dallas, Ga., received the Outstanding Graduate Award for students earning a bachelor’s degree. Christopher Fenn, a graduate student in industrial and systems engineering from Pittsburgh, Pa., received the Outstanding Graduate Award for students earning a master’s degree. Maria Ranieri, an ASL-English interpreting major from Oneonta, N.Y., received the Outstanding Graduate Award for interpreting students earning a bachelor’s degree. Lisa Meyer, a graduate student from Little Neck, N.Y., enrolled in the secondary education of students who are deaf or hard of hearing program, was the 2017 NTID college delegate for graduate students.